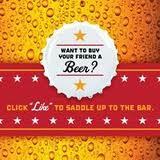 TGI Friday’s, an America restaurant, has introduced ‘Buy Your Friend A Beer’ application for Facebook users to help their friends to buy a beer during summer. According to the company, the new application enables any Facebook user of 21 years and older to buy their friends up to five beers by ‘liking’ the Friday’s fan page and placing an order through the custom tab. Recipients receive an electronic gift card to redeem in restaurant and priced at $5, regardless of the recipient’s regional location, and is redeemable for any beer of choice, non-alcoholic beverage or food item at any local TGI Friday’s, claims the company. The guests redeeming an e-gift card can also choose from the following, new regional craft beer selections which includes (availability varies by state): Harpoon IPA, Magic Hat #9, New Belgium Fat Tire Amber Ale, and Goose Island Honkers Ale. “No matter the time or place, our guests can share that Friday feeling and use this latest app to surprise their Facebook friends, including dads, with a cold one this summer,” Gewinner added.